As stated by many, this is from Gundam Seed Astray: Blue Frame. nice scan! is it really gundam? doesn't look any any previous gundam mecha. Yeah I'd have to guess that it's from either Gundam SeeD or not yet it's really badass. I'm just curious as to what series that is from. Because I think that I've seen that before if not seen one similar to it. Thats Gundam Astray Blue Frame - Second L version. 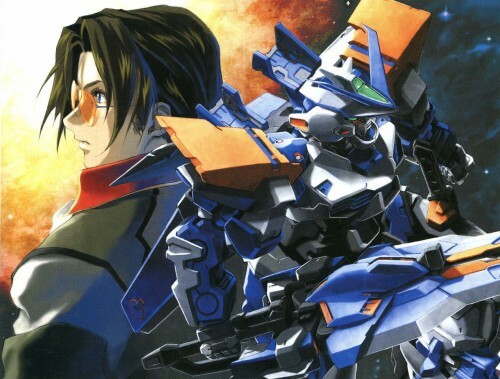 It is technically from Seed, it just doesnt appear in the anime series, just in the the 4 spin-off mangas to Gundam Seed called "Astray", "Astray R", "Astray B", and "X Astray". Although the 3 Astray Gundams Red Frame, Blue Frame and Gold Frame dont appear in the tv series they still interact with the storyline. This is a very cool scan of Gundam seed Astray Blue Frame 2nd L... Totally rare and nice. Thanks for your hard work. That is the Blue Frame Gundam Astray from Gundam Seed Astray. It's pilot is Gai. I have the model Gundam Astray Blue Frame 2L too... it's really cool, but his giant "Tactical Arms" sword was too heavy for him! ('Till know I dunno how to make it pose holding the sword with 2 hands!). But, finally, there's a generous person had made a cool wallpaper to dedicate it... Thank you so much, I like it! Great scan of Astray's Gai Murakumo, I really like this character. I really wish they did a series dedicated to the SEED Astray characters, it has so many awesome characters. blue astray is so cool. Wish there was a new 50 episode series with the Astrays point of view xd that would be cool! anyways great pic! love it.